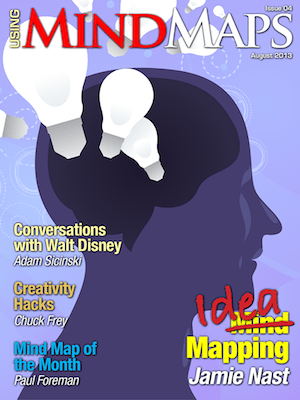 The August 2013 Edition of Using Mind Maps Magazine is finally here. What a month it's been! Apple's Developer Website was down for two weeks - in the month that I wanted to launch a new version of the Application and in the month that I wanted to launch an iPhone Version! But, I am happy to say, the new version of the Application that includes the iPhone Version has been released. Double work is needed for the Full Version and the iPhone Version, as the iPhone Version is a separate Text Version (with images and video) to help you consume content easily while on the go with one-hand navigation. Navigation is a simple left or right swipe to navigate between articles and articles now scroll in the text version to make reading and scanning articles easier. I really like the text version, even though it's not as beautiful nor full-featured as the Full Version. I was sceptical at first, as reading a magazine on the small screen did not seem to make sense. But the Text Version makes all the difference. And you get all of this at no extra cost. So, if you haven't done so now, get hold of Using Mind Maps Mag today on the Apple App Store and enjoy it your way. Jamie Nast tells us why she uses the term Idea Mapping instead of Mind Mapping. Her Story is an interesting one. Her article is a perfect example of the diverse thinking that we would like to promote in the magazine. If you have an interesting take on Mind Mapping, let us know. Paul Foreman provides the Mind Map of the Month, a beautiful hand drawn Mind Map on Creativity, which is the main theme that runs through this edition. Adam Sicinski does a fascinating 'interview' with Walt Disney and discusses creativity, courage and imagination. What questions would you ask Walt Disney - and how do you think he will answer? Chuck Frey shows you how to increase your creativity with Mind Mapping Software. He also has a great video on writing with Mind Maps - sure to get those creative juices flowing. BiggerPlate, the biggest online Mind Map Sharing Community in the world has an upcoming unplugged event in Utrecht, The Netherlands. Check out their site, their YouTube Channel and The Event Page for more details. And... if you do have an iPad, iPhone, or iPod Touch, Get Your Copy Now!